Despite facing hard times and setbacks in life, Michael Wells has dedicated his life to helping and serving others. 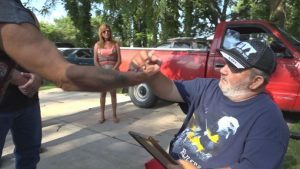 After positively impacting the lives of so many veterans, this Navy veteran receives the support and recognition he deserves. Michael discovered his desire to serve others early in life when he joined the United States Navy. However, it was upon retirement from the Navy that Michael discovered that serving others was more than a desire, but a necessity in his life. After retiring from the Navy, Mike struggled to find the meaning and purpose that life in the military provided him. After fighting substance abuse and anger issues, Michael battled his way back through service to his community by founding the Veteran Appreciation Fund and the Flag Awareness Program. The Veteran Appreciation Fund pays respect to veterans in the South Bend, IN community by providing them a simple thank you for their service. Many veterans who served in the Vietnam War never received a welcome home or thank you upon returning home. The Veteran Appreciation Fund provides these veterans with a long-overdue hero’s welcome home. Michael Wells and fellow veterans of American Legion Post 357 make surprise visits to veteran’s homes, such as Flonnie Dees, to present them with a plaque, certificate and a flag to thank them for their service in the Vietnam War. The Flag Awareness Program educates students on the American Flag and its symbolic meaning from the perspective of a veteran. Michael and American Legion Post 357 veterans visit South Bend area schools and present the Flag Awareness Program to students. Students learn about different parts of the flag and how to properly fold it. As a part of the program, flags that are old and worn down get replaced with new flags. Michael Wells and American Legion Post 357 surprise Navy Veteran with long overdue welcome home as a part of the Veteran Appreciation Fund. This award was just the start of much bigger things to come between James and Michael. James continued to work with Michael by supporting the Flag Awareness Project. But the two reunited in 2015 when Michael injured his retina while at work. Unable to work and while waiting for his workers comp, Mike and his family fell behind on their mortgage payments. Mike had given so much to others, there was little leftover to see himself through his own hard times. James helped Michael place a request for assistance through the Homes for Heroes Foundation. 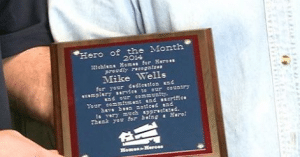 The Homes for Heroes Foundation was able to help Michael’s family get caught up on their mortgage payments and regain financial stability unit workers comp kicked in. Michael refused to let this setback stand in the way of continuing to serve others. For Michael, this was an opportunity to get back on his feet and pay it forward by serving even more veterans in the South Bend community. 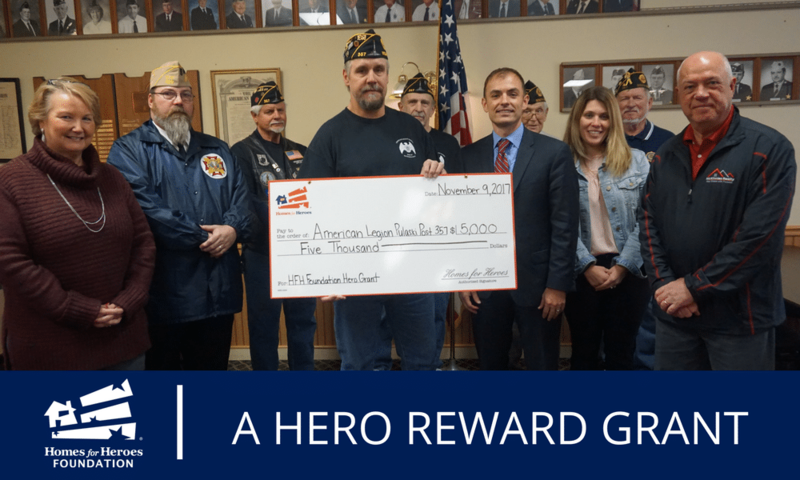 Michael and American Legion Post 357 have launched fundraising campaigns, such as the Stars and Stripes Forever Ride to generate more awareness and funds for the Flag Awareness Project. At least half a dozen veterans continue to receive a hero’s welcome home each year through the Veteran Appreciation Program.